As a lifelong amateur astronomer, I want to offer my appreciation of how the Department of Agriculture adds significantly to the quality of life for everyone who has a chance to visit such places like the Cosmic Campground when a project like this is approved. Sustaining and enhancing outdoor recreation opportunities in this way is of great value to the public. By offering people an opportunity to appreciate our open spaces and a dark night sky, we bring the public closer to an understanding of the importance of nature and energy conservation, and the impact of light pollution and other wasteful habits. Back in 2009, I was fortunate to have some vacation time near the Grand Canyon with my wife Frances and stepdaughter. For years, I had invited Frances to view the night sky at our home on Cape Cod, but it never seemed to interest her much. As we drove south from the Canyon in the dark, about 20 miles out on highway 64 I pulled off the road, and shut the car off. We all got out of the car in full "darkness" with no moon, and found that we could easily see our shadow on the ground merely from the light of Venus in the west... My wife exclaimed, "Oooohhh, NOW I understand why you look at the night sky so much!" She grew up in England, and had never looked at the night sky much at all. The sky is also never that dark here on the east coast where we live. One of my other interests involves Amateur Radio, and the Marconi Site is part of a National Park here on Cape Cod. In 2012, National Park Ranger Barbara Dougan invited two Amateur Radio operators, myself and one other gentleman, to erect a portable radio station at the original Marconi Wireless location on the very fragile dunes of Wellfleet to commemorate the 100th anniversary of the sinking of the Titanic. When activities like this are supported, it truly brings greater awareness of the importance of the department's mission and enriches many lives. I hope that your department will continue to support such endeavors going forward, thank you. Below is a photo of Michael Oort (at left), with me at my telescope, set up in downtown Falmouth, MA during one of several evenings of Astronomy public outreach I did this past summer. For many visitors, it was the first time they had seen Saturn's rings firsthand through a telescope. Rich Richins forwarded me your email concerning the Cosmic Campground. I drove out there from Las Cruces on Saturday, May 23rd and spent two nights. It was during the 1st quarter moon, so I only intended to check out the site and do some visual observing. I got a late start out of Las Cruces at about 5:15. I intended to stop for gas in Silver City, but ended up pressing on as I wanted to reach the site before dark. I arrived about 8:30 and was pretty much sucking fumes in my truck!! The drive was uneventful and easy. I did have some deer cross the road in front of me before getting to Glenwood, so had to slow down and be alert. The directions from the website were perfect, and the site was easy to find even at dusk. My dog Buster enjoyed exploring the area, and tried to make friends with the locals (cows!!). Late in the evening I could hear an elk bugle. I was very impressed with the site and facilities. The restrooms were nice and very clean. The horizon was beautiful and not blocked in any way by local features. Even with the bright moon in the sky, it was evident that the sky was very dark. Once the moon set, the milky way was well above the horizon and looked fantastic. The seeing was not the best that night, but the transparency was very good. There was some light traffic on NM180 during the night, but the site is well off the road and headlights were not a problem. The next day Buster and I went to Alma and got gas. I bit more expensive than Silver City, but understandable given the location. I received a 10-cent per gallon discount for paying cash which is good to know. I also picked up a few snacks at the little store. I then took a trip up to Mogollon for some site-seeing. Buster enjoyed walking through the cool water in the stream. Then we headed up the road 50 miles to Bill Evans lake. Given it was Memorial Day weekend, there were a lot of people at the lake. During another visit I’ll be bringing my fishing gear! The weather got cloudy, and windy on Sunday, but the ClearSkyChart indicated that the sky would clear after 1am, which it did. My friend Jerry showed up on Sunday and spent the night with his camper and scope. I had a solid 4G signal on my Verizon phone which sure was nice. We packed up Monday morning to head back to Las Cruces. It appears that there eventually will be an RV dump which would be great. But given the toilets provided, there was no need for anything but my grey water tank. All in all, I’m very impressed with the site and will be going back this weekend (12-14 June) to do some imaging. I expect that I will make 2-4 trips there a year depending on the weather during new-moon weekends. Please add me as a Friend of The Cosmic Campground. This is a fantastic resource for NM astronomers and I intend to promote it when I can. I made a presentation to the Astronomical Society of Las Cruces at our last meeting about my site survey. I showed lots of pictures, one which I have included below. Feel free to use the text of this email and/or picture on your website if you like. My first trip to the Cosmic Campground was a good one. Steve and Buster and my family (with Allyson's BF and his dog, Olive) enjoyed two nights there. The site is good, and the sky is definitely dark. The locals are friendly (we met several of them including the local ranger). The weather was reasonably good both nights. My clan hiked on Saturday at Pueblo Park Campground; there are lots of nearby hiking trails and neat stuff to see. 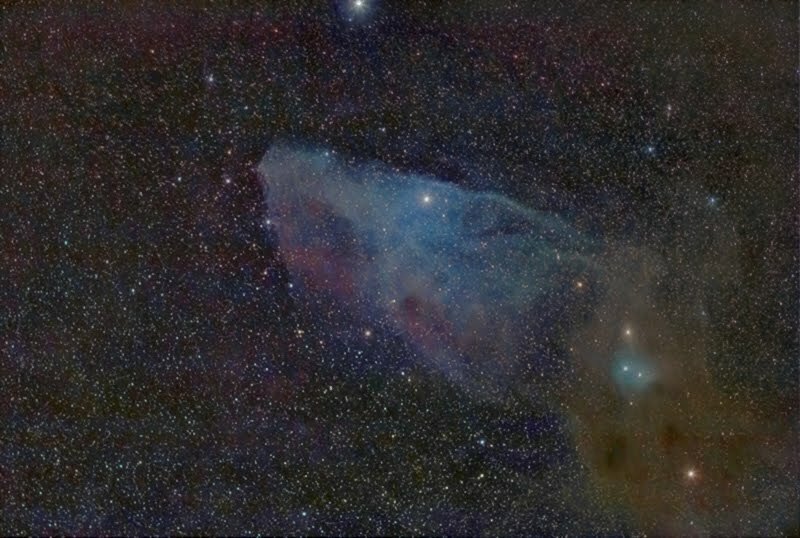 I spent both nights imaging the Blue Horsehead Nebula (IC 4592). It's a large, but dim nebula in Scorpius (not far from where Saturn is lurking these days). This was imaged using a 200mm Canon lens at f/3.5. Fifty-two 5-minute subs (ISO 800) were used in the image (4.3 hours). Stacked with Nebulosity and processed with Photoshop CS5. Special thanks to Steve for loaning me his G11 power cord (mine was having 'issues'). The locals are starting to talk up a star party for October. I don't recall if they mentioned a specific date, but October 9-10-11 is close to the new Moon. It would be neat if several of us could support this. It's definitely dark up there.